In the early 1990s, I went to Patna, in Bihar, India, on a consulting assignment at NIH's Ganga Plains Regional Center. 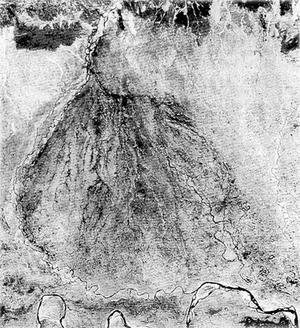 The assignment included a visit to the Kosi project, in Eastern Bihar and neighboring Chatra, Nepal. I was accompanied by three staff engineers from the center. The trip to the Kosi river valley took our party to the town of Birpur, where we settled down for lunch at a place conspicuously labeled "Hotel DeLuxe". To my surprise, I noticed that there were no eating utensils, so I made a point of requesting them. In the meantime, my companions proceeded to eat without the utensils. Ten minutes later, I again requested the utensils. The person in charge told me very politely that he had sent somebody to look for them. It took another ten minutes for them to produce the utensils; apparently, they had looked for them all over town. I later realized that there are four ways of eating in this world: (1) using a knife and fork, as in most of the Western world, (2) with chopsticks, as in China and other Asian countries; (3) with a tortilla or flatbread, as in some parts of Mexico, the Arab world, and Africa, (4) with the fingers, as in many parts of India. 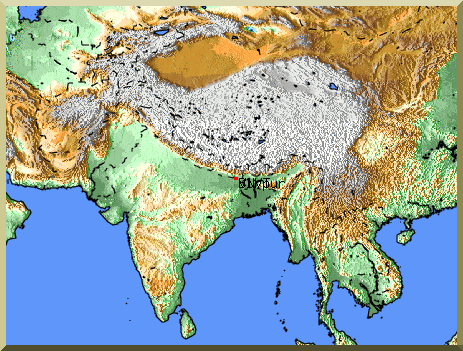 Satellite image of the Kosi river valley. The town of Birpur, in Bihar, India, shown with red dot. 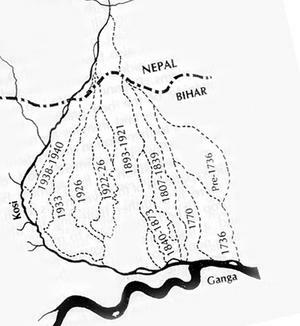 Kosi river's shifting courses through the past two centuries.